Hello Everyone. 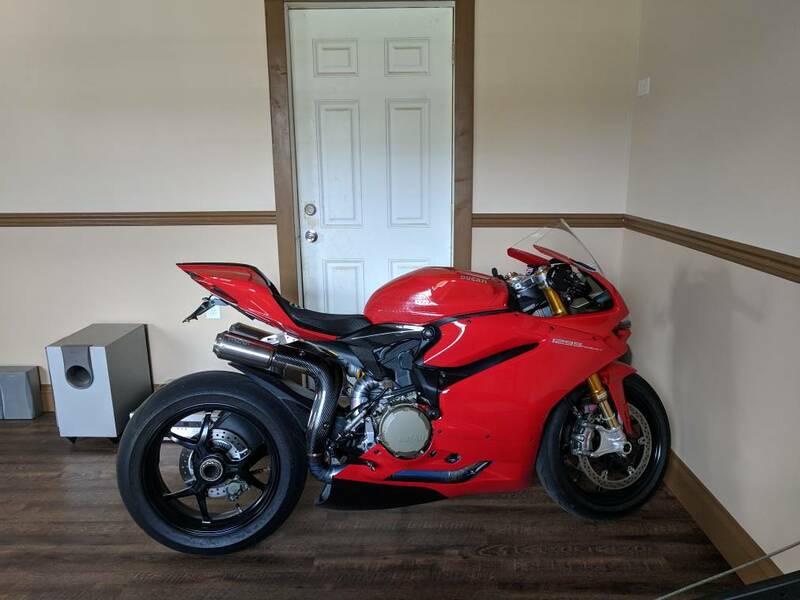 I am currently new to the forum and currently in the process of purchasing a new 1299S. I have a few questions regarding this motorcycle since this is the first Italian motorcycle I have every owned. First off, when does the 2 year warranty on the motorcycles begin? At the date of your purchase or the date the dealer purchased the motorcycle from the factory. Second, I currently own a 2009 R1 which has been perfect for me on reliability, what are some the quirks this bike has that I should be looking for? Third, What is a ideal break-in procedure for this bike?. Lastly, anyone have a good suspension setting for a 155lb rider? Thanks for all your help and wish me luck! While I’ll say this. It’s a good cycle overall, but not without its faults. At 155 you are probably too light and suspension will be stiff so set your sag to the upper range and try to switch to progressive rate for the spring. I’m 170 and I find the suspension stiff but I’ve not switched to progressive just yet. Warranty - starts when you buy the bike. Quirks - fluffy throttle respose with the OEM muffler and mapping can make getting the bike off the line intersting. OEM seat is rubbish - very slippery. If your legs are long enough get a Ducati comfort seat or race seat (adds about an inch to the seat height but is much better). Suspension - stiff! I weigh 140 lbs and I have left the springs alone. Adjust the sag until front and back move the same. I have left the Race settings as standard. I have set Sport up with maximum engine power and softer damping. I find it ok on all but the bumpiest roads. On smooth tarmac it is sublime. Its a great bike. I’ve done 15,000 miles on mine. There are those who follow the instructions in the user manual (max 6k rpm for first 600 miles) and there are those that take a bike to the track, do a couple of sessions, change the oil and consider the job done. Take your pick. I rode mine hard for the first few hundred miles, but generally kept to the recommended revs ceiling. Last edited by razz; Apr 13th 2019 at 11:28 PM. Thanks bro for the info. My R1 is set up pretty stiff so I am used to it. Thanks for the feedback. I never worn in a V-twin type of motor so I was unsure if there was a certain way it has to be done to get the best performance out of this engine. Those are some pretty huge pistons in that motor (4.5 inches+!). That is huge!